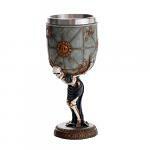 Take your rituals and spellcastings to a whole new level with these beautiful, fantasy-themed goblets! You can also enjoy your morning coffee, tea, wine or liquid spirits with these fantasy-themed vessels. The mystery and intrigue of Egypt comes home with you in this vibrantly painted and bejeweled goblet. Perfect for your Egyptian rituals and offerings, wonderful for a night of wine and magic, or simply admire as a bejeweled ornament on your altar this goblet captures the imagination. The wings of the scarab are individually painted with bold colors of blue, green, gold and red while between the scarab's wings is clutched a red jewel. From the rim of the goblet all the way down the stem no detail is left untouched in this finely detailed & stunning goblet. Hearken back to the times of King Arthur and the Knights of the Round Table as this golden goblet brings you a touch of Camelot elegance. Transporting rich images of the Knights of the Round Table into the realm of highest gothic fantasy, this ceremonial Holy Grail rises to take its place as a highly prized Medieval centerpiece. Perfect for Gothic ritual or to set the mood as historic renaissance decor, this Medieval Design Toscano exclusive is cast in quality designer resin and hand-painted in metallic gold tones. For display use only. 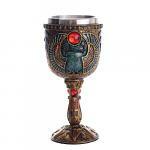 The Norse god Loki is featured on this Viking goblet painted in colors honoring Celtic lore. Bring out the prankster from within you as you drink from this finely-detailed goblet that is wrapped in Celtic knots and gold paint from rim to stem. With a stern look of trouble on his face the Loki goblet stirs the emotions of trouble and fun at the same time. Whether you love Viking legend, you are a fan of the prankster god Loki, or you enjoy evoking the spirit of the ancient past you will enjoy this unusual conversation piece. 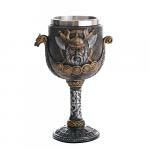 The Norse god Thor is featured on this well-crafted and well-detailed goblet worthy of any Viking warrior! 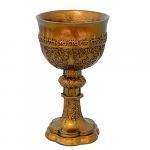 His name is inscribed on the base of the goblet surrounded by various styles of Celtic knots painted in gold. From the rim to the stem this goblet features stunning reliefs of Celtic lore and Viking revelry. Thor is represented in a frame on the goblet with a stern and royal expression and a noble cloak pinned across his shoulders. His winged helmet standing proud on his head he is ready for battle! 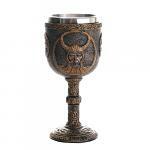 This is a great goblet for those who celebrate the Viking culture or who want to pay homage to the Norse gods. Hanging in the heavens are the constellations celebrated in Astrology as they are carried on the back of the toga-clad skeleton. This is a greatly detailed goblet as the draped toga falls around the skeleton in a realistic puddle and he stands on a finely-crafted base. 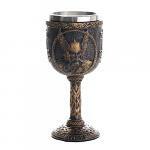 The cup of the goblet is crafted to look like grey stone. This is a great goblet for anyone who likes Gothic decor or who loves find unique Astrological decorations. You will love this stunning goblet as it quickly becomes a part of your magical decor. Ready for battle! The Viking warrior is depicted on this stunning goblet as crossed battle axes and a shield are the backdrop. The bowl of the goblet is the traditional dragon ship or longship as the stem and base are decorated in silver and gold Celtic knots and Rune spears. The resin goblet is crafted to look like ancient stone and it captures the Viking spirit beautifully. Whether you are using this goblet for offerings, for rituals or simply for wine with dinner it is a statement piece that will be the jewel of your drinkware. 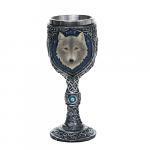 The legends of werewolves and secret ceremonies come to life with this white wolf goblet. In sobering hues of blue and silver this goblet looks like it was taken out of a Medieval fairy tale. Bejeweled and well-decorated this goblet will become a mainstay of your altar when you want to work with all matters of courage and magic. Every angle of the goblet is decorated and can be proudly displayed from every angle. From rim to stem this is a regal piece of drinkware that will have you singing songs of the royal court and entertaining possibilities of a full Moon.